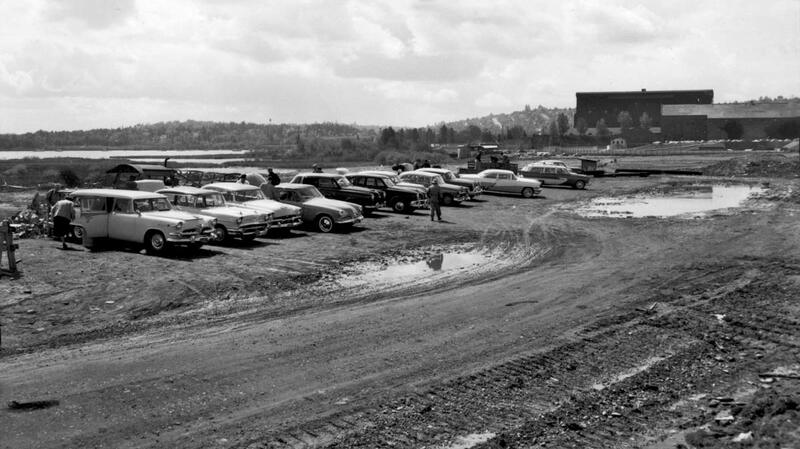 Not World War Two but May 2, 1958 – The Montlake Dump with Husky Stadium behind. Then I remembered what my dear editor had told me. After a quarter-century of appearing every week in Pacific I would be, so to speak, dumped for a special issue devoted to human waste. In this sense, I was still part of the issue that would not include me. At least for the moment I too was some of that stuff caste aside by the only species with the combination of a gift for language, an opposable forethumb, an erect posture, and the unique capacity for self-deception alongside a similarly unique understanding of its own mortality. And it is worth recalling that in the end then we are all stuff. Wanting to give the readers of this blog something in the way of then-and-now and also stay in sympathy with the Footstep theme of this special week at Pacific I searched for something appropriate to take the place here in the blog of yet another now-then article that might have appeared in the paper were there only more affordable newsprint or pulp and ink in the world. And since I have gathered plenty of historical pictures of waste and human discharge it was not difficult to find something appropriate. From that horde I have chosen an aerial of north end Seattle that includes some of Montlake, most of the University of Washington Campus, the southern skirt of Ravenna and the western edge of Laurelhurst. Since Jean and I have neither wings nor the budget to fly we hope for some local pilot to repeat it and send the results to us free of charge. The most fitting “Footstep” part of this photograph, the part that has to do with managed waste, is showing right-of-center. It is the site now and long since of the UW’s commitment to the higher and longer education available with a golf driving range. It is also the beginning spread of the Montlake Dump or “sanitary fill” that here brightens the Union Bay wetland of Lake Washington with a mix of garbage and dirt. For a few decades it was the favorite home of seagulls and a great stinker of methane, “odorless” as advertised. Now imagine that same old clock and we will start at noon. * At “noon” part of the extended Roanoke/Eastlake neighborhood at the north end of Capitol Hill appears at the top. * To the right of it is the University Bridge (1919) to the University District (Founded as a platted neighborhood in 1890 but still known then as Brooklyn). * Next, descending the right side through the University District and the north end of the U.W. Campus (1895) we come upon the 45th Street viaduct (1940-41). 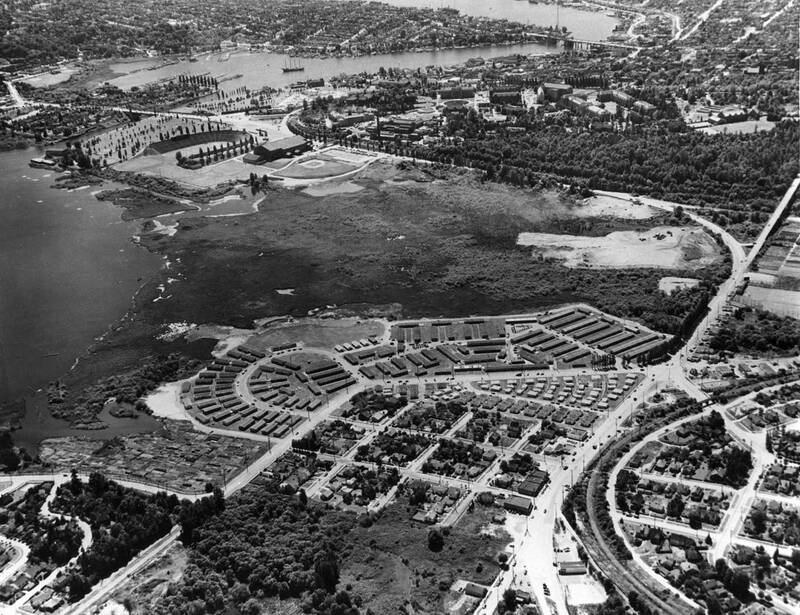 To the far right there is as yet no sign of the University Village (1956). This is the most southerly part of what was once a large acreage of truck gardens and commercial nurseries that grew up in the pocket drawn by the long curve (1887-88) of the Seattle Lake Shore and Eastern Railway around the north end of the original Union Bay. The railroad’s first “crop” was logs. * Both those garden acres and most what shows center-right in this aerial was exposed with the lowering of Lake Washington in 1916 for the official opening of the Lake Washington Ship Canal in 1917. * And next at the five-star intersection of NE 45th Street, NE 45th Place, Union Bay Place NE and Mary Gates Memorial Drive NE (around 3:30 on our clock) we may look in all directions – first to the south (left) and into the regimented sprawl of housing units built during the Second World War. * Below the government housing are some of the oldest homes of what was developed in the late 1880s and 1890s as the town of Yesler – a mill town named for Seattle’s pioneer industrialist who moved his saws here in 1887 after his last mill on Yesler Wharf burned down. The move was made possible by, as noted, the construction that year of the Seattle Lake Shore and Eastern Railroad, which had a spur extend to the mill on Union Bay when the water was at its original level. The mill was near the contemporary location of the U.W. Fire Arts building off of Mary Gates Memorial Drive. * The Union Bay that remained after the 1916 nine-foot lowering of Lake Washington was, in places, deceptively shallow. In the early 1950s while heading with my brother Ted for the Montlake Cut in a small motor boat we turned aside to investigate an sailboat overturned in Union Bay. Although it was yet well off shore we discovered that the sailors who were busy trying to right it were both standing on the bottom with the water still well below their shoulders. Thinking of our outboard motor, we thought it best to get out of there. * Upper left are the sports palaces of the University including Hec Edmundson pavilion (1927) and Husky Stadium (1920). The Montlake Bridge (1925) is there too. * The University’s golf course has not yet been lost to the University Medical School 1949) or stadium parking. * Above the bridge on the south shore of Portage Bay is the (barely visible) Montlake Field House (1934) and to the right of that the shoreline routes of Boyer and Fuhrman Avenues East leading back to the University Bridge. * Finally (near 11:30 on the clock) the four-masted schooner yacht Fantome waits out the war anchored in Portage Bay. But then it stayed put after the war until 1952 while in litigation. The owner, A. A. Guiness, the British maltliquor manufacturer, refused to pay personal property taxes on it to King County. Eventually, Aristotle Onassis purchased it as a wedding gift for Grace Kelly and Prince Rainier of Monaco. When the Greek shipper was not invited to the wedding, he kept the ship. 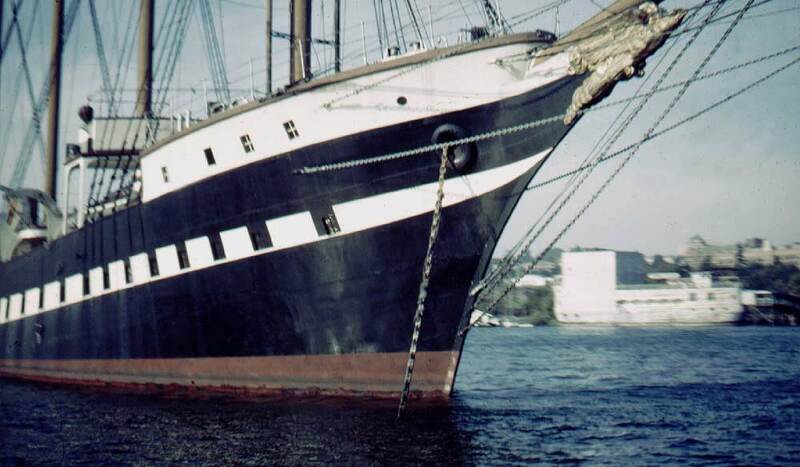 Ultimately, the Fantome wound up running luxury cruises in the Caribbean, where it was lost in 1999 to Hurricane Mitch.